Bright golden amber color. Fruity aromas and flavors of peach and strawberry shortcake, dried flowers, and coconut dream bar with an crisp, dry-yet-fruity light-to-medium body and a tingling, interesting, crisp finish that exhibits impressions of honeyed grain, bread crust, minerals, and pepper finish. A snappy, spirity, seemingly rye-high blended whisky that will pop in cocktails. Bottom Line: A snappy, spirity, seemingly rye-high blended whisky that will pop in cocktails. 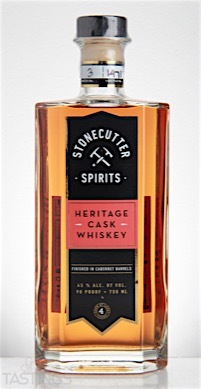 87 • Stonecutter Spirits Heritage Cask Whiskey 45% (USA) $61.00. 92 • Stonecutter Spirits Single Barrel Gin 45% (USA) $55.00. 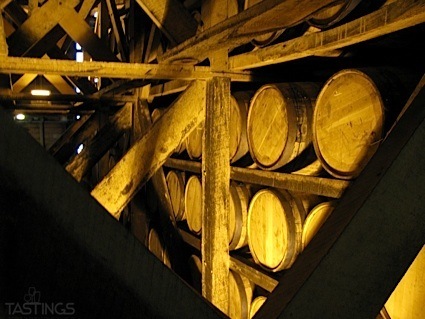 Distilled from Bourbon Mash Whiskey is a relatively arcane category, taking into effect only a few American whiskies with a bourbon mash bill but aged in barrels that are not new white American oak; these may have other non traditional aging or processing. Examples tend to be less complex than true bourbons, but these products can be crowd pleasers. Stonecutter Spirits Heritage Cask Whiskey rating was calculated by tastings.com to be 87 points out of 100 on 9/12/2016. Please note that MSRP may have changed since the date of our review.